one a toy aimed at the opposite gender. human like faces. I mean what’s not to love about dolls? maybe even go one further and buy him an anatomically correct boy doll. my husband said we’ll have to buy him an action man. category. But why not have a unisex category too maybe? shocked by this bold statement?! Please? girl wants to play with a construction or drill set? whatever toys they want, even if it isn’t considered normal for their gender! 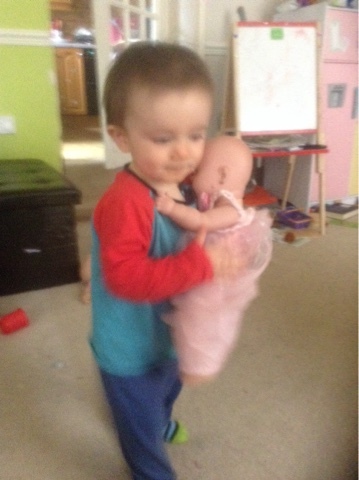 Dexter spotted a pink dolls buggy in asda just after christmas and spent the entire shopping trip pushing it around. he had christmas money so i bought it for him. He loves it. Liam wasn't so keen but he didn't really protest. Children learn by what they see and he sees me pushing him in his buggy and wants to copy. I see no harm in that. I do however dislike that things like lego, that already come in many bright and cheerful colours have now added girly colours. Why do girls need pink lego? It's not just lego either, so many toy manufacturers make normal coloured toys and then go out of their way to make the exact same toy but excessively girly. I dont understand the need for it. Really like this post! I have nothing against boys playing with girls toys and girls playing with boys toys! I've gone to a shop with my girls and they've chosen cars and boy figures and I've had no problem buying them either! It's a shame some people are so against it. My nephew plays with prams! and he's even got a kitchen! They are young! Let them play with what ever they want.